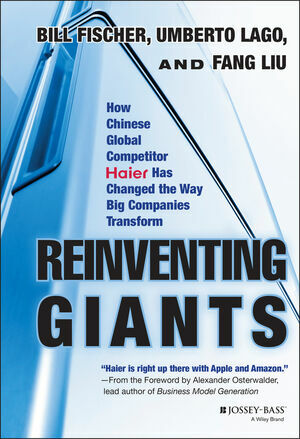 Reinventing Giants provides an exclusive look within the Haier Corporation and shows how managerial accountability and responsibility have been repositioned at every level of the organization, with the core value of market-centricity, while aligning strategy on each level of management. It includes actual work reports that show this process in detail from the ground up. The authors emphasize how a belief in the liberation of employee talent has consistently been the driving force underlying Haier's success. Reinventing Giants helps global managers rethink their own business models and accompanying corporate cultures in order to be able to apply Haier's lessons directly to their own organizations. Bill Fischer is a professor of innovation management at IMD in Lausanne, Switzerland. Formerly he was executive president and dean of the China-Europe International Business School in Shanghai and the Dalton L. McMichael Sr. Professor of Business at the Kenan-Flagler Business School of the University of North Carolina at Chapel Hill. He writes The Ideas Business blog for Forbes.com. Umberto Lago is associate professor of Management at Bologna University in Italy. He has been, at different stages of his life (often simultaneously): a university professor, private and public manager, entrepreneur,andconsultant.He is a member of UEFA Club Financial Control Body. Fang Liu is a research associate at IMD. Her research focuses on fields such as management innovation, marketing, and global business.